Any terms not explicitly defined in this DPA have the meaning set forth in the Agreement, unless otherwise stated. “Data Protection Law” means GDPR unless and until GDPR is no longer directly applicable in the UK, together with any national implementing laws, regulations and secondary legislation as amended or updated from time to time in the UK; and (iii) any successor legislation to the GDPR. The terms "Data Controller", "Data Processor", “Data Subject”, "Personal Data", "Process" and "Processing" have the meanings set out in the Data Protection Law. “GDPR” means the General Data Protection Regulation (EU) 2016/679a. 2.1 Roles of the Parties. Each Party shall comply with applicable requirements of the Data Protection Law. This paragraph is in addition to and does not replace a Party's obligations under the Data Protection Law. The Parties acknowledge and agree that with regard to the Processing of Personal Data, the Customer is the Data Controller, Virtual College is the Data Processor and that Virtual College will engage sub-processors pursuant to the requirements set forth in section 4.6 below. Where Virtual College Content forms part of the services, Virtual College will be joint Data Controller with the Customer in order for Us to determine training outcomes and retain records of Virtual College certifications. Virtual College analyse learning content and system usage, and further Process the Personal Data of Authorised Users in order to improve Virtual Colleges products are services and respond to evaluation comments and support queries. Personal Data will be Processed for purposes of providing the Services set out and otherwise agreed upon in the Agreement. Typically, this will be the provision of learning and development software and online training courses and support services to the Customer. Authorised Users of the Customer (employees, customers, partners or any other authorised user as defined by the Customer). Contact information, ultimately determined by the Customer at its discretion. Common information includes name, email, company, job title, application usage information, or any other electronic data received during the usage of the services. Personal Data will be processed for the duration stipulated within the Agreement. Where Services include Virtual College Content Virtual College will retain relevant Personal Data beyond the termination of the Agreement ad infinitum, under Our commitment to lifelong learning, enabling us to provide factual information on what a learner has studied and achieved, i.e. name, courses studies, CPD gained, test results etc. This is in line with JISC best practice and Guidance on Managing Student Records. The Customer’s instructions to Virtual College for Processing any Personal Data shall comply with the Data Protection Law. The Customer will ensure that any Personal Data provided by Customer or Customer’s Authorised Users to Virtual College will not violate the Data Protection Law. If the Customer finds out it is carrying out activities contrary to the Data Protection Law, it will immediately notify Virtual College. Where the Customer is sole Data Controller, Virtual College is instructed to Process Personal Data only for the purposes of providing the data Processing services set out within the scope of the Agreement. Virtual College will only process Personal Data on the written instructions of the Customer. If Virtual College is required by any applicable laws to process Personal Data it shall, to the extent legally permitted, notify the Customer before doing so. If Virtual College considers an instruction from the Customer to be in violation of the Data Protection Law, Virtual College shall immediately inform the Customer about this. Virtual College shall keep Personal Data confidential and will ensure that persons authorised to process the Personal Data have completed relevant training, committed themselves to confidentiality or are under an appropriate statutory obligation of confidentiality. 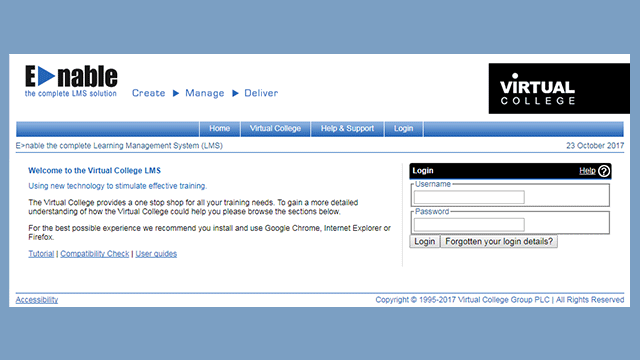 Virtual College will maintain appropriate organisational and technical security measures to prevent the Personal Data being accidentally lost, destroyed or damaged, processed unlawfully or on an unauthorised basis , appropriate to the harm that might result from the unauthorised or unlawful processing or accidental loss, destruction or damage and the nature of the data to be protected. Virtual College will be responsible for the sufficiency of the security, privacy, and confidentiality safeguards of all Virtual College personnel with respect to Customer Personal Data. 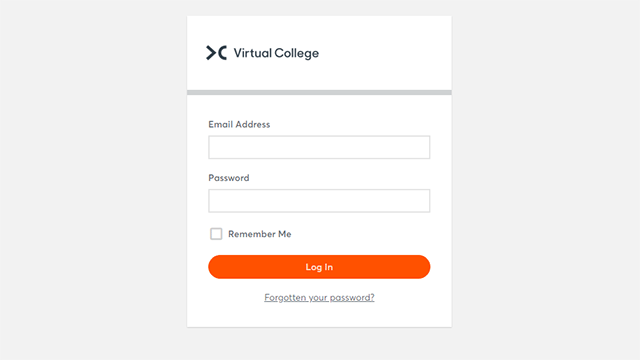 Virtual College will without undue delay of a Personal Data breach (which has the meaning given to it in the Data Protection Law) notify the Customer about any suspicion or finding of breach of security that results in accidental or unlawful destruction, loss, alteration, unauthorized disclosure of, or access to, Personal Data transmitted, stored or otherwise Processed by the Processor under the Agreement. Victual College will provide reasonable assistance, including by appropriate technical and organizational measures and taking into account the nature of the Processing, to enable Customer to respond to any request from a Data Subject. If such request is made directly to Virtual College, We will promptly inform Customer and will advise the Data Subject to submit their request to the Customer. Virtual College shall be entitled to engage sub-processors to fulfil its obligations in the Agreement only with the Customer’s written consent. For these purposes, the Customer consents to the engagement as sub-processors of Virtual College’s affiliated companies and the third parties listed in Exhibit A. For the avoidance of doubt, the above authorisation constitutes the Customer’s prior written consent to the sub-processing by Virtual College for purposes of the Data Protection Law. Where We engage sub-processors, the sub-processing shall be carried out in accordance with the Data Protection Law and with at least the same level of protection for the Processing of Personal Data as the Virtual College under this DPA. Virtual College shall not transfer Personal Data outside of the European Economic Area without the prior written consent of the Customer and Virtual College shall ensure that the transfer is made in accordance with the Data Protection Law and that the organisations to which the Personal Data is transferred ensure an adequate level of protection. At the written direction of the Customer, where the Customer is sole Data Controller, Virtual College shall delete or return Personal Data to the Customer on termination of the Agreement unless Virtual College is required by law to store the Personal Data. Virtual College shall maintain complete and accurate records and information to demonstrate its compliance with this DPA. Upon written consent and within a reasonable time period, in order to ensure Virtual College complies with this DPA, the Customer has the right from time-to-time to but not more than once in any year to: (i) request information from the Virtual College; and (ii) appoint an independent third-party consultant to conduct an onsite inspection. In the event of the above Virtual College shall provide the Customer with all information necessary for such audit, provided such information is within Virtual College’s control and is not precluded from disclosing it by applicable law, a duty of confidentiality, or any other obligation owed to a third party. Furthermore, the Customer agrees that any audit will not disrupt normal business operations and any individual – whether employed by the Customer or an independent third-party consultant – is of the required professional qualifications and bound by a duty of confidentiality. This DPA is an amendment to and forms part of the Agreement. If you require a signed copy of this agreement, please contact your Account Manager or email customersupport@virtual-college.co.uk.